Unattended self-audit function. 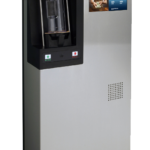 The LTA-350 can be completely audited without removing cash from the machine. Reduces or eliminates the need for cash drawers. Minimizes transfers, vault buys and sells. High-speed operation (12 notes per second). Operational cassette minimizes cash exposure within the branch. Download the LTA-350 brochure here.